Doesn't everyone need a textured charcoal gray skirt in their wardrobe? Absolutely! And now I've got one too! New Look 6192 has always been my go-to pattern for an elastic-waist skirt that doesn't scream "elastic-waist skirt" when worn and unfortunately looks like it is now out-of-print. Can't get any easier than 1 pattern piece.... yes 1 (one!)!..... that serves as both front and back. Seriously. This skirt runs a little short and I've always made view B. You can see #1 here, #2 here, #3 here, #4 here and #5 here. Yep, I like this pattern juuuust a little, I'd say. Guess this is skirt #6. Made my usual size 10 in this pattern, with serged seams instead of a 5/8" seam allowance. Pockets and lining were added to the last couple of versions and did the same here. This one was also lengthened 2 1/4" to make it not quite so short. For some reason I've always used 1" elastic in the casing waistband, and it's always worked well. Back view shows a little elastic-waist look, but one I can live with. Blind-stitch hemmed by machine a 1" hem. That is a feature on my machine that took a little getting used to, but now it's my go-to way of hemming a garment like this. A classic A-line skirt that's easy to sew and easy to wear. I am not purchasing any more ready-to-wear clothes, but am allowing myself to wear ready-to-wear clothes that I still own like this rusty orange top I am wearing today. The cream jacket is Pattern N from Happy Homemade Sew Chic by Yoshiko Tsukiori. Its a lovely skirt, the fabric is gorgeous! I'm quite a fan of elastic waist skirts -never used to be, but now I like the practicality and the comfort. New Look skirts are so lovely too. Lovely denim - it's the smart sort, so you will find the skirt very useful. Enjoy wearing it. Although I sometimes think elastic waist skirts and trousers are something you'd find in a nursing home, I like them a lot. Yours is really lovely and the fabric is perfect. Another wonderful make! I have to have an elastic waist for health reasons. I have liked elastic waists since I was about 30. 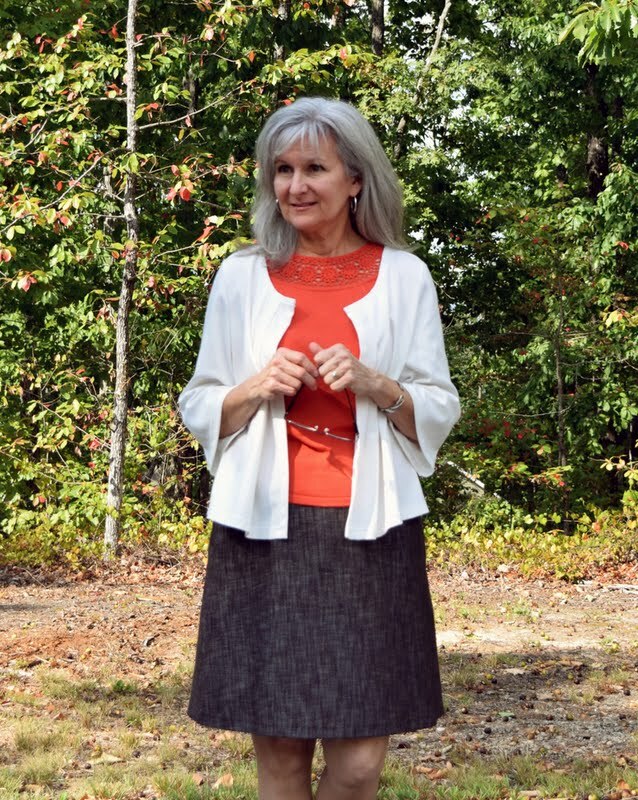 (70 now) I wore elastic waists when I had to have dressy office outfits. I wore a shell that just covered the waist line by about three inches and had a jacket on over the skirt and shell. Since I have sewn for 66 years, I know how to camouflage the elastic waist look as I sew and in the style pattern I use. About a dozen skirts came from one pattern I drafted. At this point in my life, I am not working and don't care if anyone knows I wear elastic waistbands! I use the 1" elastic, too, but not the non-roll. When I was going to make patterns and send my daughter skirts, tshirts, and strapless tops over 100 miles and with her doing the measuring, she feared the elastic waist look and the gathered top of the strapless top. I assured her I knew what I was doing. She tried on the strapless tops and was pleased they fit flat with no gathers. Great skirt. I find charcoal goes with everything - better than black or navy even because you can pair charcoal with those neutrals too. Love elastic waist garments because of their comfort amd my changing waist size. I must look out for this. Some elastic waist garments have all those gathers which adds inches where I don't need it. This will be so useful for you.